Columbia Police Chief Skip Holbrook announces the arrest of a woman in connection with the weekend shooting death of a man at a local motel. 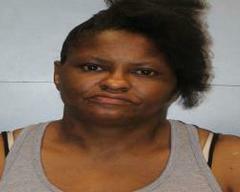 Natila J. Tucker (DOB: 12-15-1974) is charged with Murder and Possession of a Stolen Vehicle. Tucker was located by CPD investigators early this morning while walking near the intersection of Main Street and Elmwood Avenue. Tucker accompanied police to CPD Headquarters were she was interviewed and taken into custody. Tucker was previously named as a person of interest related to the case. Tucker, who is allegedly a prostitute, is accused of arguing and physically fighting with the victim about money for sexual services at the Coronet Motel on North Main Street on May 8, 2016. Tucker is accused of shooting the victim in the head. The victim, identified by the Richland County Coroner as Tyron Jackson was discovered deceased by a motel employee who quickly notified police. Tucker is also accused of stealing Jackson’s car from the scene and was in possession of his personal items after the murder. Tucker was taken to the Alvin S. Glenn Detention Center (ASGDC).